"Whole city's goin' to hell. You can't take a pee anywhere anymore." During the late 1980s, early 1990s, high-quality, low budget horror films were everywhere. This was an era of terrifying discovery, when I enjoyed obscure, edgy fare like Re-Animator, Brain Damage, and 1988's Maniac Cop. Presumably trying to cash in on the success of Robocop at that time, writer Larry Cohen came up with a screenplay for director William Lustig, who helmed the similar 1980 film, Maniac. While it didn't fill theater seats, the result has become a cult classic through the years, even spawning a pair of inferior sequels. The streets of New York City are dangerous enough, but now a rogue killer dressed as a police officer is roaming them. The NYPD ison the case, led by Lieutenant Frank McCrae (Tom Atkins), who is at odds with Commissioner Pike (Richard Roundtree) over who the killer is. The next victim is the wife of Jack Forrest (Bruce Campbell), a cop who has been having an affair with fellow officer Theresa (Laurene Landon). After admitting to having been at the same hotel on the night of his wife's murder, Jack is considered the prime suspect. It soon becomes clear that Jack is the least of anyone's problems, as he is soon on the run from the killer (Robert Z'Dar) himself. 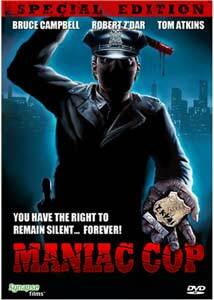 I hadn't seen Maniac Cop since the last VHS release, which amounts to more than 10 years. Revisiting it is a great experience, as the film holds up surprisingly well. Cohen and Lustig have given us a wonderful blend of gritty cop drama and ultra-gory slasher film that proudly wears its B-movie credentials. If there wasn't a crazy, deformed, ex-cop killing New York City's denizens, this could easily be mistaken for a poor man's Dirty Harry or similar police procedural. This actually broadens the story's appeal, but at the end of the day, it's the slasher elements that win out. The B-movie charm is most evident in the cast, led by The Evil Dead's Bruce Campbell. While rarely mentioned when it comes to this genre great's résumé, but he gives another wonderful performance, highlighted by his patented deadpan line delivery. John Shaft, Richard Roundtree, is here as well, hamming it up as only he can. Z'Dar is effectively creepy in the title role, using his unique face (with and without makeup) to his and the audience's advantage. Those who like psychological thrills, or scary twists and turns around each corner are in the wrong place. This is pure unbridled slasher greatness, sticking to the genre's formula throughout most of the picture. The story is engaging, but it's simply there as a framework for a series of sequences featuring stupid characters finding themselves alone in dark places, and winding up with their body sliced open. A brisk pace helps as well, and there are plenty of little nuances to look for, including a cameo by Sam Raimi as a newsman. Raimi, reuniting with Campbell, also helped shoot a part of the sequence involving the St. Patrick's Day parade. While Maniac Cop has never been placed among the top slasher films, it's got enough going for it to warrant a look, whether you're a longtime fan or just curious. Image Transfer Review: This brand spankin' new anamorphic widescreen presentation is simply remarkable. We still have to deal with a slight bit of grain, but much care has been taken to bring this to a state I didn't think was possible. Image detail is sparkling and very sharp, while the previously grubby color palette is bright and lively. Audio Transfer Review: The audio is even more of a revelation, with the original Dolby Digital 2.0 track being one of a trio of options. There's a Dolby Digital 5.1 mix as well, but the best of the bunch is the new DTS 6.1 mix. The other two tracks are adequate, but the DTS features some amazing channel separation, especially when it comes to the score. The film just sounds more sophisticated than ever, as directional effects and booming bass add so much to the sequences where the title character is in action. 1 Feature/Episode commentary by Bruce Campbell, writer/producer Larry Cohen, director William Lustig, and composer Jay Chattaway. Extras Review: The extras begin with a commentary track that's been brought over from the earlier Elite DVD. Featuring Bruce Campbell, writer/producer Larry Cohen, director William Lustig, and composer Jay Chattaway, this track is a lot of fun, thanks in large part to Campbell's presence. These guys are great together, telling tons of fun stories, creating one of the funnier audio commentaries around. Another carryover is nearly six minutes of additional footage that was shot for the Japanese TV broadcast. This material is mostly filler, but there is some interesting character interaction here. A brand new feature, Maniac Cop Memories, is a 12-minute interview with Robert Z'Dar. This action/horror film veteran seems to be having a great time discussing his acting experiences, particularly in the Maniac Cop movies. The rest of the extras include a trio of theatrical trailers (one from France), two TV spots, and a Spanish radio spot. Maniac Cop is still a fun, gruesome horror film that has seen its share of home video releases on many formats. Synapse gives us a new special edition release that blows the others out of the water. A gorgeous new anamorphic widescreen transfer, DTS audio mix, and a nice collection of extras make this a must for this cult classic's fans.